An attractively illustrated coffee-table doodad, billed by novelist Trevor as "a writer's journey, a tour of places which other writers have felt affection for also, or have known excitement or alarm in"--but mostly a string of excerpts from Irish literature, from the Tain to the present, having vaguely to do with the landscape. The chronological presentation seems a fundamental mistake, since it suggests the very sort of academic investigation Trevor disclaims as an objective; only in the final chapter--a whirlwind clockwise tour around the island--does the organizational premise work. 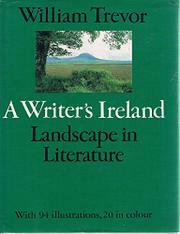 Many of the literary references are predictable: Goldsmith's "The Deserted Village"; Allingham's "The Winding Banks of Erne"; Yeats on Coole Park; Synge on Wicklow and the Aran Islands; O'Sullivan on the Blaskets; Joyce and O'Casey, from their different vantage points, on Dublin; MacNeice on Belfast. But Trevor covers some other, more overlooked bases as well: Jonathan Swift and the 18th-century garden; the S. C. Halls' early Victorian "picturesque" travel book about Ireland; John Banim; the "vastly" overlooked short stories of George Moore (though, oddly, Trevor includes no excerpts from Moore's The Untilled Field); Ulster novelist Forrest Reid. Some writers appear awkwardly fitted into the "landscape" category (Flann O'Brien's inclusion on the ground that his Dublin was "a playground for the imagination" seems a bit thin); and Trevor's virtual exclusion of excerpts from the original work of contemporary writers impoverishes the book by the omission of (for example) Seamus Heaney. Some fine raw material--seemingly thrown together.